How Do Grease Traps & Interceptors Work? What is a Passive Grease Trap? 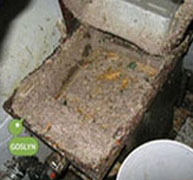 Passive grease traps are plumbing fixtures that contain pools of rotting food waste. Fats, oils, and Grease (FOG) are lighter than water and float to the top of the tanks. 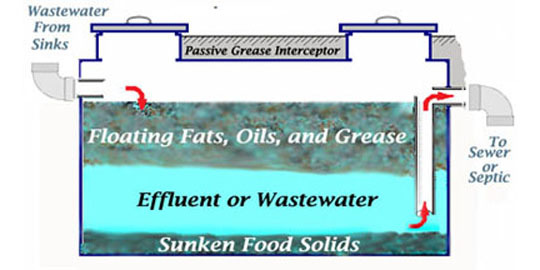 Passive Grease Traps (above ground) are metal or plastic tanks required in foodservice facilities to prevent fats, oil, and grease from entering the sanitary sewer or septic system. Grease interceptors are large in-ground outdoor tanks that prevent FOG and food solids from entering the sanitary sewer or septic system at restaurant facilities. Conventional Grease Traps are referred to as passive grease traps and gravity based grease traps. 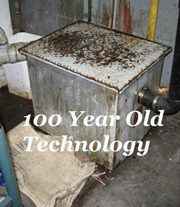 Grease Traps were originally designed over 100 years ago. Grease Trap technology has remained virtually unchanged since the 1880's. 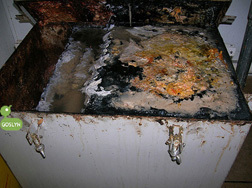 Restaurant wastewater enters Grease traps from 3-compartment sinks and automatic dishwashers. The grease trap tank acts as a reservoir holding the wastewater and food solids that enter the trap. As the wastewater cools, the fat, oil, and grease (FOG) harden and the food solids settle. The FOG, being lighter than water, floats to the top of the grease trap. The wastewater is forced through the grease trap and out to the sanitary sewer. The FOG and food solids remain in the tank, increasing in volume daily. Food solids and grease sludge (brown grease) settle to the bottom of the grease trap. If you take a bucket of water and pour in FOG, the FOG will float to the top of the bucket and harden. A grease trap functions in the same manner. FOG fills a grease trap from the top of the tank to the bottom. The FOG fills the grease trap from top down, displacing the wastewater from the middle of the grease trap and into the sanitary sewer or septic system. In-ground grease interceptors work in the same method but at a larger scale. Grease waste (brown grease) in a conventional grease trap is difficult to measure. Grease traps must be disassembled to view the level of waste inside the trap. Grease traps are required by law to be emptied or pumped out when the grease sludge occupies 25% of the tank.By-law enforcement have tools that measure the content levels of grease traps. Grease Traps were never designed to stop 100% of the grease from reaching the drain. A well maintained grease trap allows 15% of the grease in the wastewater to perpetually flow into the sanitary sewer. 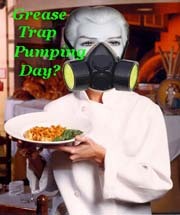 Grease traps at full capacity discharge 100% of the restaurant grease and wastewater into the sanitary sewer. When a grease trap is full of grease sludge the trap is incapable of capturing any grease or food solids whatsoever. 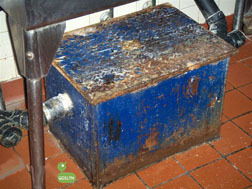 Passive grease traps and grease interceptors do not control the inflow of restaurant wastewater. 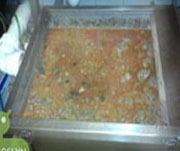 During busy automatic dishwashing and sink draining periods restaurant grease bypasses the grease trap. Conventional grease traps do not have enough time to separate the FOG from the wastewater (retention time). The fast and hot outflow of wastewater from automatic dishwashers allows FOG to bypass the grease trap completely. Grease trap pumping is having a large liquid holding truck come to your foodervice facility. The truck,, equipped with a large tank, brings the hoses inside the facility to the grease trap. The complete contents of the grease trap are pumped back into the truck's tank. In-ground grease interceptors are pumped outside of the building. Grease trap pumping is typically performed when rank odours or grease blockages are discovered. Be sure to always get a quote first for grease trap pumping. Like every business their are always unscrupulous operators. A common scam of grease trap pumping companies is "skimming". Instead of the pumping company taking the complete contents of the grease trap the pumping company only takes off the very top layer of grease from the interceptor tank. Three quarters of the tank does not get pumped out. This practise will lead to the grease trap backing up and overflowing. Ask to see the grease trap before the lid is closed. This may save you money and nasty inconvenieces. Choose a reputable and licensed grease trap pumping company. Stainless steel counters, sinks, dishwashers, and exhaust are a few of the restaurant standards in commercial kitchens. Inexplicably, Grease traps are made of steel, fibreglass, PVC and plastic. 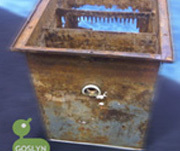 Rusted, leaking, or cracked grease traps cannot be easily repaired. Rusted grease traps must be replaced. Gasket and baffle repairs are frequent on conventional grease traps. Polyethylene or poly grease traps were designed and engineered to outperform other plastic materials. Common for mechanical stress in a polyethylene fixture is where a hole is cut to connect pipes, gaskets, and fittings. Polyethylene, though a strong chemical composition, does become brittle over time. Grease Interceptors are frequently sized at 1000 Gallon to 2000 Gallons for restaurant use. 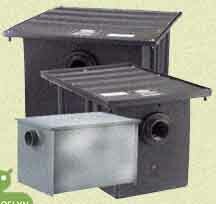 Grease interceptors are tanks made of cement, PVC or fibreglass that hold the fats, oil, grease, and food solids. The interceptor tanks are usually buried to the exterior of the restaurant. To install a grease interceptor a large trench must be excavated. A cement footing is built to support the grease interceptor. The interceptor is placed within the trench. Pea Gravel (3/8 inch gravel) is poured into the trench to occupy the space between the earth and the grease interceptor. A second cement slab is required at ground level. The cement slab at ground level is anywhere between 18 to 30 inches above the grease interceptor for various levels of support and potential traffic. 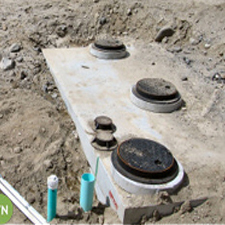 Part of the required install is an extension collar to connect the access hole at ground level and the grease interceptor approximately 30 inches below ground level. The access hole fitting is removed when the grease interceptor is pumped out. Approximate dimensions of a 200 Gallon grease interceptor are 65 inches (width) X 40 inches (height) x 32 inches (Depth). In total, with extensions a grease interceptor will sit between 70 and 80 inches below ground level. 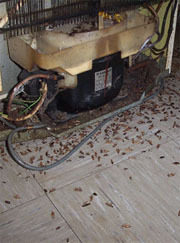 Grease interceptor pumping is a permanent on-going monthly expense. A 1500 Gallon in-ground cement Grease interceptor is pictured above. Grease Interceptors fail between the 3-compartment sink and the Interceptor. The long length of pipe guarantees grease blockages. Can you afford to have a rancid grease trap in your kitchen facility? What do you pay in Annual grease trap pumping fees?